Vancouver's Arts Club Theatre is staging a revival of "The Odd Couple" at the Stanley Theatre stage, and Province reviewer Paul Durras was not exactly effusive in his evaluation. Neither was he accurate in the details. "Wikipedia can tell you Walter Matthau and Art Carney did the movie in 1968..." he writes, by way of background. 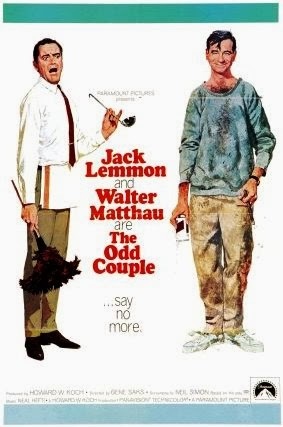 Wikipedia can try to tell me that, but memory tells me it was Matthua and Jack Lemmon who starred in the film version. In fact, the Wikipedia entry I read today does say exactly that in the first sentence. Further on in the entry we are told that Art Carney originated the role of Felix Unger on Broadway opposite Matthua. That must have been the sentence the eyes of our time-pressed reviewer alighted upon and he ran with it. Later in the Province piece, Durras tells us that Matthew "Parry" of Friends fame will be the next actor to don Felix's apron, and that Andrew McNee as Oscar in the Arts Club production "bellows like Jackie Gleeson in The Honeymooners." Honestly--an entertainment writer who misspells the name of an iconic legend of TV comedy? And he got Gleason's name wrong, too! Coincidentally, that last misstep may have been avoided if Durras had continued reading that Wikipedia page, where it is revealed that at one point the movie version of "The Odd Couple" was set to star Frank Sinatra (!) and, yes, Jackie Gleason (who of course headlined in The Honeymooners along with Art Carney). Then again, Wikipedia may not be the best place to go for spell-checks, as evidenced by the fact that in said entry, Felix's Unger's last name is consistently, and falsely, rendered as "Ungar." Also, Tony Randall, who played Felix on TV and was a veteran of the Broadway stage...no, no--that's enough. I've got to stop this somewhere and get on with my life.